2300AD games range from interstellar exploration and interstellar war, down to the gritty streets and the mega-cities of the human core. This is a game about people, and their rise to the stars. Aliens are a part of the 2300AD milieu, but the focus of the game is on humans. 2300AD strives to obey the laws of the universe as we know them. The stutterwarp drive, the technology that allows humanity to travel faster than light, is the sole departure from this. Some of the other technologies bend the laws a little, but that's from the standpoint of the early 21st century. Three hundred years in the future is a long time. There are no blasters or laser swords in 2300AD, no magic anti-gravity or artificial gravity - just guns and helicopters, spin habitats and spaceplanes. 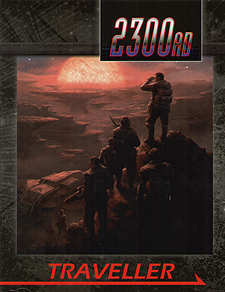 At the same time, though, 2300AD is a game, not a hard-and-fast technical simulation.